Manipur is not for the faint-hearted, we were told, before we flew to Imphal on March 20. Yes, we were aware of the economic blockade and we knew the state had been wracked by years of unrest, so we were pragmatic about what awaited us on the first leg of our Northeast trip. But, for some time, we had been following closely all the news from Manipur. Elections for a new state government had been held on March 4 and 8. The results were declared on March 11. Three days later, after much political drama, the BJP was invited to form the government, toppling the Congress, which had been in power for 15 years. With the BJP taking charge, the first thing to happen was the lifting of the economic blockade on March 19, one day before we arrived. How fortuitous was that? The blockade had crippled life in Manipur for more than four months. Now citizens who had been sorely affected by the shortage of essential items could begin thinking of normality again. We saw the new developments as a sign. With the god of vacations clearly having given us the thumbs-up, we boarded our Indigo flight in Bangalore in high spirits, confident we were going to have a fabulous holiday not only in Manipur, but also in Assam and Meghalaya. How right we were to be optimistic! Commits alumna Monika Khangembam (Class of 2012) came to Imphal airport to pick us up and accompanied us to the Classic Grande hotel (above), our home for four nights. Monika, who runs an NGO in Imphal and who was still jet-lagged having just returned to Imphal after spending a week in New York, went out of her way to ensure we enjoyed our stay in Manipur and we are grateful to her. As soon as we were done checking into our hotel, off we went sightseeing with Monika. First, a short walk from Classic Grande brought us to a popular roadside cafe for a little replenishment, after which we headed off in a “share-auto” to Ema Keithel, or Mothers’ Market. Among the few hundred women manning (pardon the expression) the stalls was this lady who had a good laugh when she spotted tourists looking goggle-eyed at her wares. 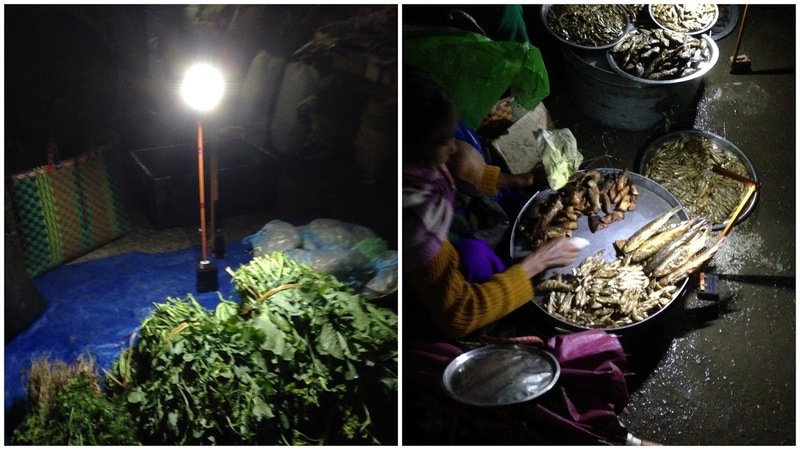 At nightfall, mini-lamps are switched on at the Mothers’ Market and outside as the vendors put the spotlight on their goods in an effort to maximise sales before it is time to pack up. Covering the distance from Imphal to the Northeast’s largest freshwater lake in Moirang, about 50 km away to the south, took us an hour-and-a-half. On the way we were joined by Ashok Sapamcha, Monika’s good friend (more about him below), who guided us to a spot rarely visited by tourists. 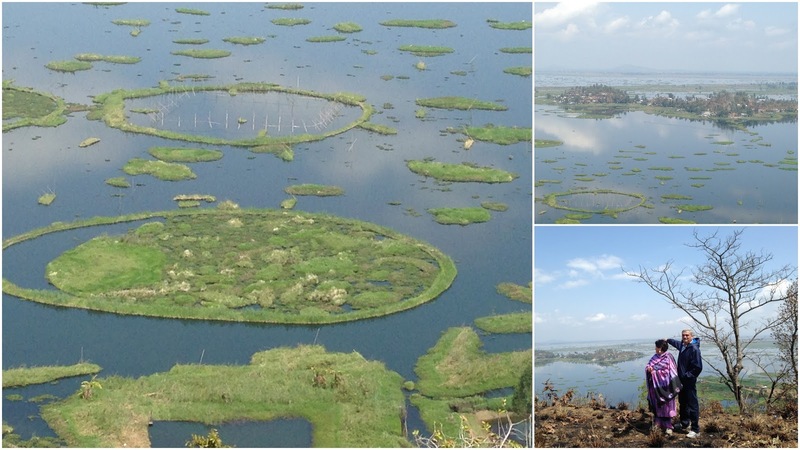 From here, we got a panoramic view of Loktak and the phumdis, as the floating islands are known. What am I pointing to? That cluster of dwellings in the distance, also seen in the photograph at top right, is Karang, India’s first cashless island. 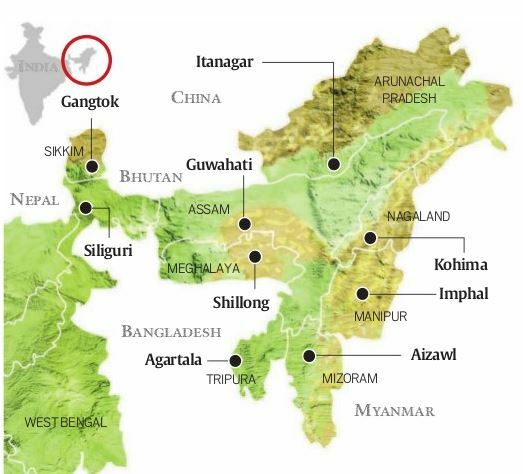 Ashok Sapamcha, who runs a tourism operation based out of Moirang, is a young man who cares deeply about his hometown of Moirang and his home state of Manipur. He seems to know every inch of the land intimately and he ensured that our trip on March 21 — from an amazing view of Loktak Lake from the top of a peak to an unforgettable experience of a visit to a phumdi hut for tea and smoked shrimp (pictures below) — was something that can only be described as out-of-this-world. I recommend his services highly. Thank you again, Ashok. 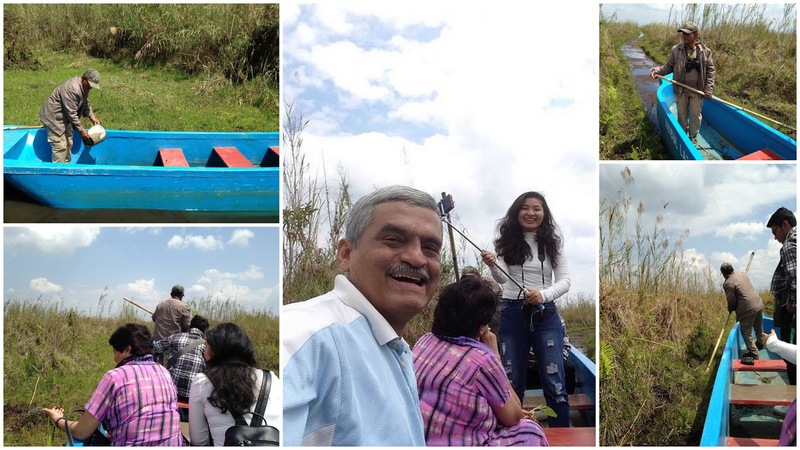 At Keibul Lamjao National Park, the only floating park in the world, we were hoping to catch a glimpse of Manipur’s state animal, the sangai. But we were not lucky enough. Never mind, a friendly member of the park’s staff consented to give us a canoe ride through a phumdi, pictures above and below. Watch a brief video clip here: NAVIGATING A PHUMDI. WILL IT BEAR MY WEIGHT? The “ground” felt a bit wobbly, but the phumdi here at Keibul Lamjao National Park was, if I may use the phrase, rock solid. 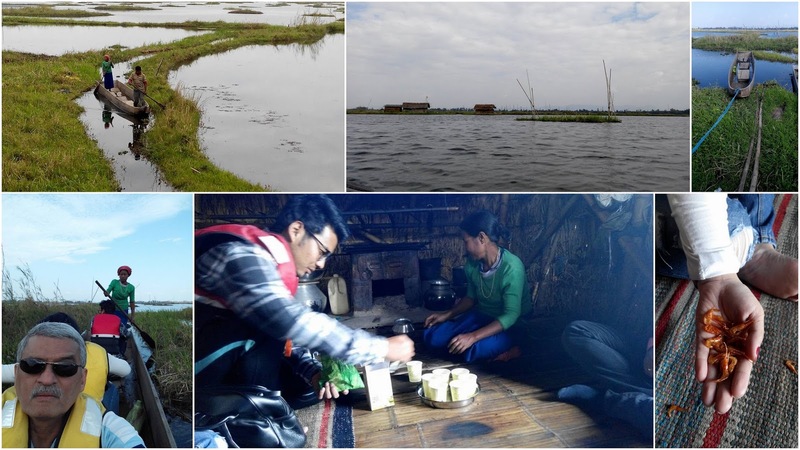 Among the lifetime’s memories that were created… lunch at a local dhaba in Moirang followed by pan, above, followed by a boat-ride to a phumdi hut on Loktak Lake for tea and smoked shrimp, below. All arranged by Ashok Sapamcha. An inner lobby of the Classic Grande gussies up for the night. 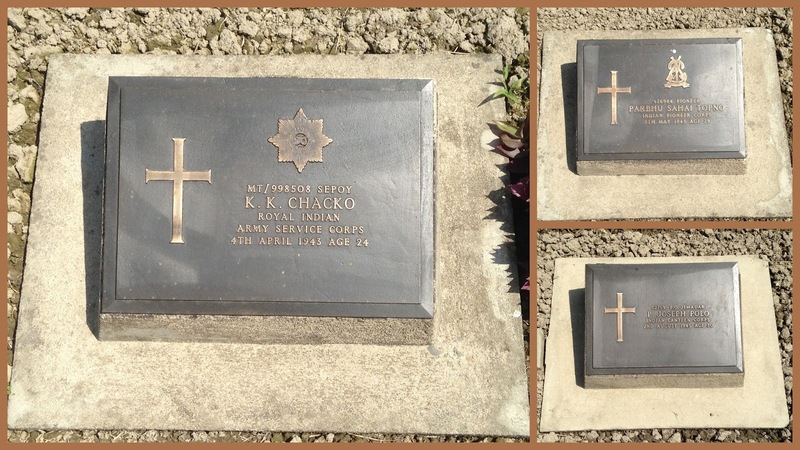 At the Imphal War Cemetery, gravestones mark the sacrifice of soldiers from India (see below), Great Britain, Canada, Australia, and even China who died in in 1944 during the battles against the invading Japanese army. The cemetery is located at a walkable distance from the Classic Grande. The day would begin with reading the newspapers… naturally. 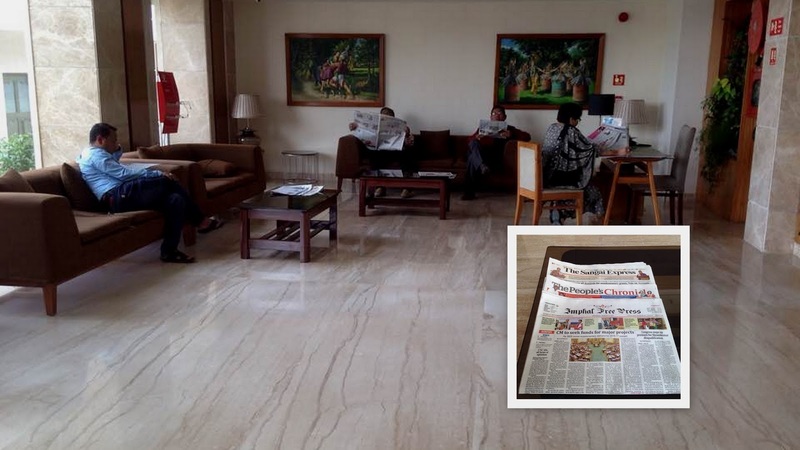 Every morning the hotel staff would arrange all the English dailies neatly on coffee tables in the lobby. A pair of mythical dragons, known as Kangla Sha, stand alert at the entrance to the “Uttra”, the coronation hall of the kings who used to rule Manipur. Kangla was the ancient capital of Manipur, and the fort is situated at the heart of Imphal city. BELOW: The Ibudhou Pakhangba temple, which was consecrated in February 2010. The seven flags on the roof, by the side of the pagoda, represent the seven Meitei clans and Ibudhou Pakhangba is one of the main deities of the Meiteis. It was such a pleasure — and a privilege — to be able to watch Akhu Chingangbam, Manipur’s most famous folk singer, and his band, Imphal Talkies, perform at Ougri 2017, the tech and cultural fest organised by NIT Manipur. In the video above, recorded at the venue, Akhu sings one of his best-known English songs, Lullaby, written “for all the children around the world in conflict zones”. When I first met Akhu that evening, I had told him I was a fan of Lullaby. To my surprise, he remembered that and towards the middle of his set before he launched into the song, he dedicated it to “Professor Ramesh Prabhu, who has come here all the way from Bangalore”. To say I was touched would be an understatement. BELOW: The official music video, with lyrics, for Lullaby, published on YouTube in September 2013. …followed a very special feast at Monika Khangembam’s home on our last night in Imphal. As award-winning filmmaker Oinam Doren(third from left) put it, “Awesome dinner after a long time. 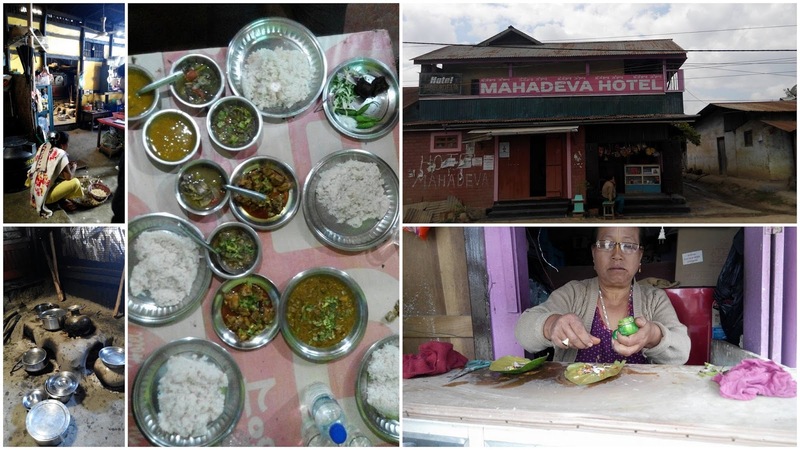 11 Manipuri cuisines in one night. I know how much meticulous planning, effort and patience it takes to cook because I am also a cook. A bow to Monika’s mom.” The man I have got an affectionate arm around is singer Akhu Chingangbam, whose live concert we had attended earlier in the evening. 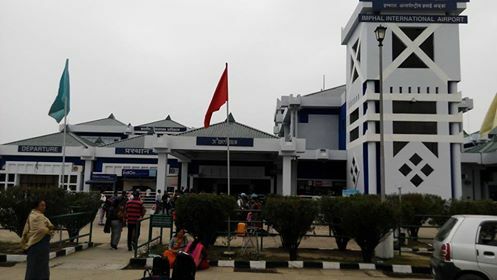 On March 24, after four standout days in Manipur, it was time to take the Jet Airways flight to Guwahati from Imphal airport. On the agenda: Kaziranga National Park, home of the one-horned rhino, and Majuli, the world’s biggest river island. MANIPUR MEMORIES: Ashok Sapamcha introduced us to Mangka first when he showed us this video (see above) on his phone during our car ride to Loktak Lake. Monika Khangembam, who accompanied us on this trip and who had persuaded Ashok to join us, later introduced us to filmmaker Oinam Doren, who has produced and shot this video. On April 15 I learnt from Oinam’s Facebook post that Mangka was performing in Imphal that evening. We missed out! About the author – Ramesh Prabhu is a professor of journalism at Commits, one of India’s premier institutes for media studies. Before turning teacher, he worked with some well-known media organisations such as Mid Day, Mumbai, and Khaleej Times, Dubai. His blog, The Reading Room, is quite popular with media professionals across India.